BrightWave is the leading email marketing agency. With over 15 years of experience managing the best email programs in the country, BrightWave elevates eCRM and cross-channel programs through industry-leading innovation, relationship orchestration and pioneering inbox experiences. On March 14, we hosted over 400 digital marketers at our third annual EiQ. Check out the recap page to view all the pictures, session videos and other highlights in one place. In the 2018 Email Agency Buyer’s Guide, The Relevancy Group awarded BrightWave the most Client Satisfaction medals and highest Relevancy Ring scores, including a perfect score in Strategy and Data Management. 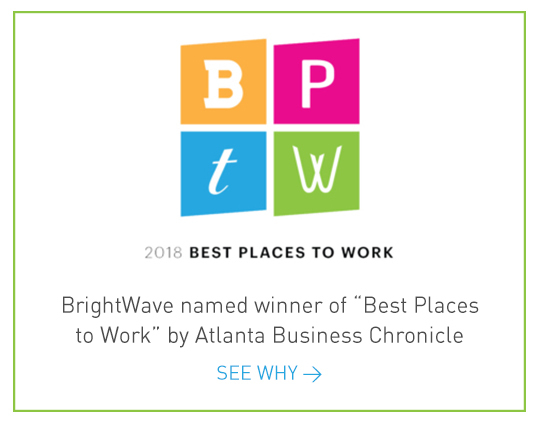 TOP 10 "BEST PLACE TO WORK"
“Best Place to Work” in Atlanta, GA.
Beauty meets functionality for growth of revenue and relationships in this Look Book. We’ve showcased some of our creative output, focus on innovation, compelling content and dynamic approach to results-oriented campaigns that drive business goals while improving the customer experience.